When former journalist Nikol Pashinyan ousted the authoritarian government and took power in Armenia last year, it seemed to promise a new era for the country’s media, which had long been seen as “not free” by international observers. But nine months on, journalists say the picture is mixed. While the government no longer tries to directly orchestrate news coverage, the new authorities – bolstered by a supportive population – are proving thin-skinned to criticism. And Pashinyan himself, now prime minister, has repeatedly launched public attacks against journalists, which many in the media say has created a climate of intimidation against critical reporting. 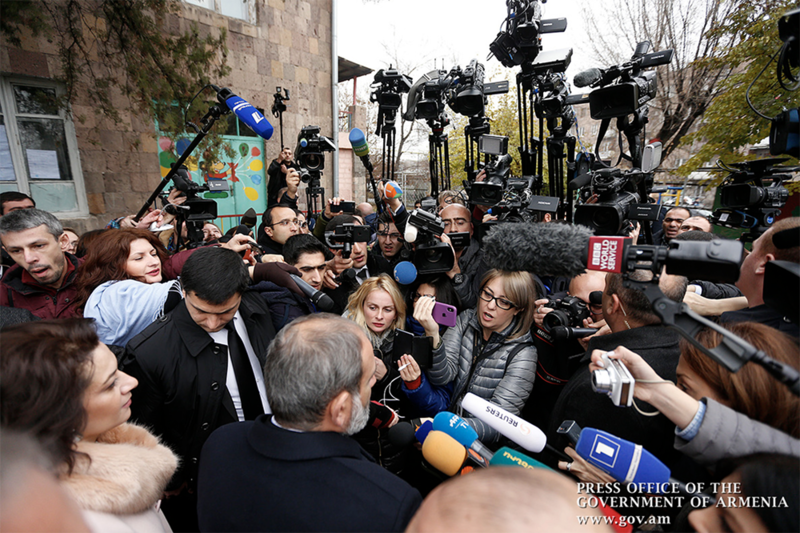 Coverage of Pashinyan is for the most part positive, but media that report on missteps by the new authorities – including conflicts of interest or foreign policy troubles – are often subject to a backlash. Journalists also have been concerned at a handful of aggressive actions toward the media. In September, police raided a news organization, Yerevan Today, in the mistaken belief that it was behind the leak of sensitive recorded phone conversations among government officials. After two months, police returned the computers they had seized without explanation, Sevak Hakobyan, the website’s editor-in-chief, told Eurasianet. In November, police paid a visit to another news website, Aysor, seeking the original video of an interview with a prominent businesswoman; it turned out that the video was in fact from a public press conference. At the same time, Pashinyan’s wife, Anna Hakobyan, is the editor of a newspaper and a website, The Armenian Times, which many say has gotten a suspiciously large number of scoops since her husband took power. Pashinyan “understands the power of the media, he feels like a journalist and this is why he gets into these conversations with the media,” said Boris Navasardyan, president of the Yerevan Press Club, at a roundtable discussion last month on the press in Armenia. Overall, journalists credit the new authorities with being more accessible. But that, too, has been changing for the worse in recent months, they say. Another journalist, Taguhi Melkonyan of news.am, said that while government officials are becoming less accessible, the public seems to be accommodating itself to critical reporting. “Previously if you criticized government you would be called a professional, and now when you do the same, it turns out that you are illiterate and vengeful,” Khamoyan said wryly.